Below you can find links fine art cushions, screen printed cushions, aprons, tea towels, hand printed scarves and an expanding range of fabrics. If you would like to discuss licensing my artwork or designs, or wish to commission designs for your products please use the contact form or email gloria@gloriadean.com. 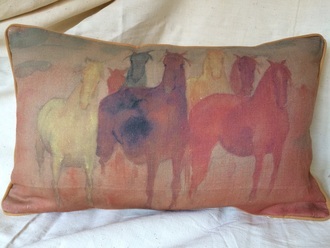 'Waiting' Fine Art Pure Linen Cushion. 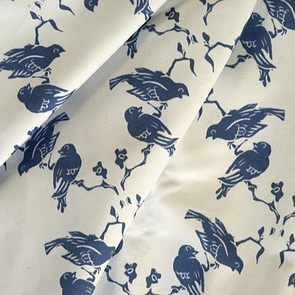 'Chatterbox' design on half panama cotton fabric. New Cotton Tea Towels screen printed with Chatterbox pattern.